I beg to disagree. Though we shouldn’t need an excuse to spoil our loved ones, no one ever gets tired of a little adoration, so there’s nothing wrong with taking an extra opportunity to do so. I do object, however, to the idea of going out for a special ‘Valentine’s meal’ – on the day itself anyway. In my tragically personal experience, the food is usually a bit rubbish, and so these affairs tend to end in one of two ways: either you both get so drunk with all the special champagne and the special cocktails and the special liqueurs that you pass out on the table, or you have a fight. And if you don’t do either of these things, someone else in the restaurant definitely will, while the rest of you gaze into other’s eyes adoringly over the special creme brûlée while desperately earwigging on their disappointment. No, I reckon the secret to a truly loving Valentine’s day is staying in (and, if necessary, packing the children off elsewhere). The food should be, of course, delicious, but also light enough that you don’t both pass out on the table (see above) or fall asleep during that romantic pre-bed Breaking Bad boxset. I’m hoping not to be on cooking duty this year, but if I were, I’d probably go for something much like the push-the-boat-out menu from my last book Perfect Host: steamed sprouting broccoli with parmesan butter (cliche, but finger food is fun), the Mediterranean fish en papillote above (easy to prepare in advance, and the drama of the parcel opening is very satisfying) and a fluffy chocolate pudding with an oozing caramel centre. The idea here is that you open the little parcels of fish with a flourish at the table, releasing a cloud of lemon-scented, herbal steam (ladies, remember the waterproof mascara), so it’s important that you seal them tightly with staples or a paperclip. Mix together the zest of the lemon and half the olive oil in a bowl and season. Add the fish and leave to marinate in the fridge for a couple of hours. Preheat the oven to 180°C/gas mark 4 and put a large pan of salted water on to boil for the potatoes. Make a parcel by cutting two squares of parchment paper about 30cm across, and brushing with olive oil. Divide the tomatoes between the two,and top with the basil and the capers or olives. Arrange the fish on top, drizzling over the marinade, and sprinkle over the juice of half the lemon and the wine. Bring the edges of the paper together and secure with a paperclip or staples to make an airtight parcel (if you don’t have these to hand, you could wrap them in foil). Place the parcels on a baking tray and put into the oven for about 15 minutes, until cooked through. Meanwhile, cook the potatoes in the boiling water for about 12 minutes, until tender. Drain well, return them to the pan, put back on the heat for 30 seconds to dry, then add the rest of the olive oil, season, and mash roughly with a fork or potato masher so they’re crushed but not smooth. Scoop into a bowl and put on the table. 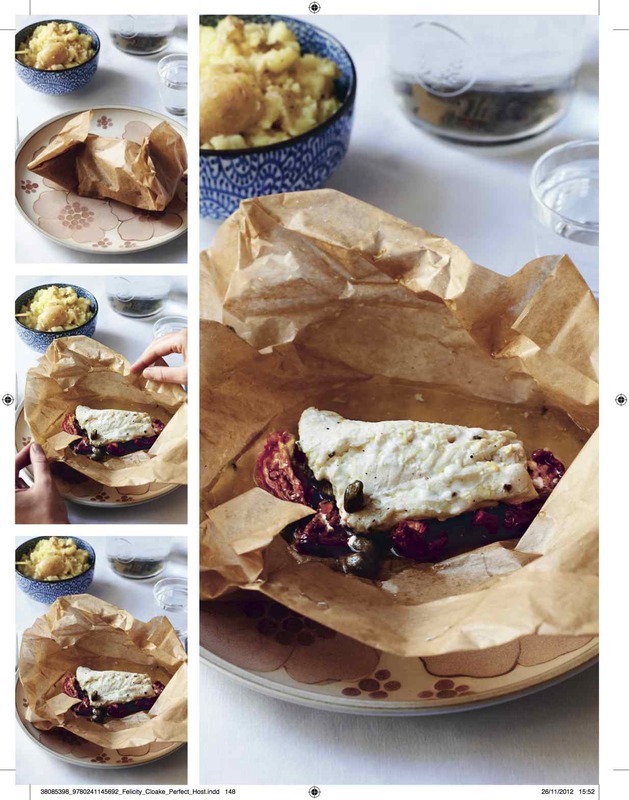 Put the papillote parcels on plates and take to the table to be opened there – hopefully in a cloud of scented steam.